A chalazion, pronounced sha-LAY-zee-on, is a cyst-like bump in the upper or lower eyelid caused by inflammation due to a blocked oil gland. It may look a bit like a stye. While a stye involves a bacterial infection, a chalazion has no infectious element and may take much longer to resolve. Meibomian glands, also known as tarsal glands, are located along the edge of the eyelids. They are an essential part of the eye, keeping it healthy and lubricated. They secrete fatty and oily meibum, and with every blink (with help from a tiny muscle called the Riolan's muscle), they spread a thin film over the tear film to slow the tear film's evaporation. Meibum also protects tears from spilling down to the cheek by trapping tears between the edge of the eyelid and the eyeball. It also makes the eyelid airtight when closed. 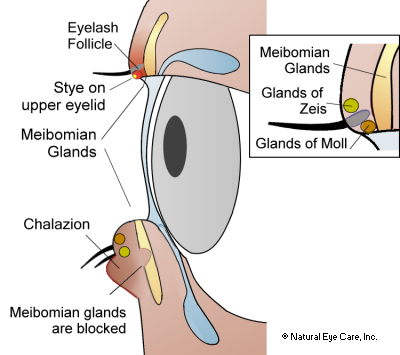 Meibomian glands are located on both the upper (about 50 glands) and lower (about 25 glands) eyelids. Glands of Zeis are also sebaceous (oil) glands that protect the surface of the eyelid, adding a protective layer to the top of the tear film. These glands secrete sebum to the middle section of the eyelash follicle, keeping it lubricated, and keeping the eyelashes from becoming brittle. Chalazia usually, but not always, do not involve redness, soreness, and swelling. Twenty-five percent of chalazia show no symptoms other than the visible bump, and they usually disappear without treatment. But they can grow to a bothersome size and even blur vision, because they distort the shape of the eye. The skin outside of the chalazion usually isn't tender and can be moved around easily without pain. Blurry vision which could result if the swelling due to a chalazion on the upper lid is enough to press on the cornea. Chalazia can be categorized as either superficial or deep, depending on the glands that are blocked. Inflammation of a meibomian gland leads to a deep chalazion. Inflammation of a Zeis gland leads to a superficial chalazion. As mentioned above, chalazia often disappear on their own. If recurring, or if the chalazia does not resolve, see an eye doctor, as in rare cases the chalazia may be cancerous. The eye doctor will drain the contents and review the test results, if needed. Chalazia tend to develop farther from the edge of the eyelid than styes, grow more slowly, and are typically larger. Styes are smaller and more superficial than chalazia, usually look like a pimple, and have a small white dot in their center indicating an infection. Diet and digestion. Diseases of the eyelid are often the result of a relationship between poor digestion and diet. In Chinese medicine problems of the upper eyelid often correspond to the spleen meridian and lower lid problems correspond to the stomach meridian. These imbalances can be prevented and improved by following diet and nutrition recommendations, including eliminating fried foods, eating plenty of fresh fruit, vegetables, whole grains, and using nutritional supplements. Acupuncture treatments may help as well. Compress. Apply a warm, wet washcloth to the affected area and hold it in place until it cools, as you would when treating a stye. EyeEase can be used in the compress by adding one dropper to eight ounces of boiled water. The water should cool before using so the alcohol has a chance to evaporate, then dip the washcloth, squeeze out excess, and apply. Recommended application time is 5 minutes, 2-3 times per day for 1-2 weeks. Hygiene. Good eye hygiene is indicated, so use a baby shampoo on a cotton swab to wash the eye lids. Don't rub. Avoid rubbing the eyes, further irritating them. Don't squeeze. Never squeeze or try to pop the lump, as this will cause inflammation, infection or damage to the delicate tissues of the eyelid. Even though a lump in the eyelid is unappealing cosmetically, it is benign and will often resolve with the simple self-care instructions above. Please see your eye doctor if it does not resolve or becomes infected, if it is large enough to press on the cornea or if it becomes a persistent problem. Your doctor may prescribe a topical or oral antibiotic. Unless there is an infection present, this will not be effective. An eye doctor may drain the contents of the lump by making a small incision on the inside of the eyelid. The lesion can be injected with a corticosteroid to help drain it. If chalazia recur in the same location, the doctor may take a sample to test for tumorous growth. 1. Stoeckelhuber, M., Messmer, E.M., Schubert, C., Stoeckelhuber, B.M., Koehler, C., et al. (2008). Immunolocalization of defensins and cathelicidin in human glands of Moll. Ann Anat, 190(3):230-7. 2. Stoeckelhuber, M., Stoeckelhuber, B.M., Welsch, U. (2003). Human glands of Moll: histochemical and ultrastructural characterization of the glands of Moll in the human eyelid. J Invest Dermatol, Jul;121(1):28-36.